From left are Matt Apple, Mechanicsburg store manager; Dean Blair, executive director; Dave Hosier, maintenance supervisor; Bill Agle, president of the Clark County Ag Society; and Zach Dennis, Apple Farm Service sales specialist. MECHANICSBURG – Next time you visit the Clark County Fairgrounds, you’ll find a mighty blue tractor helping the Ag Society push snow, mow fields, or carry carts of chairs around. Apple Farm Service’s Mechanicsburg location is excited to work with the Clark County Fairgrounds in 2019 with the signing of a corporate sponsorship. 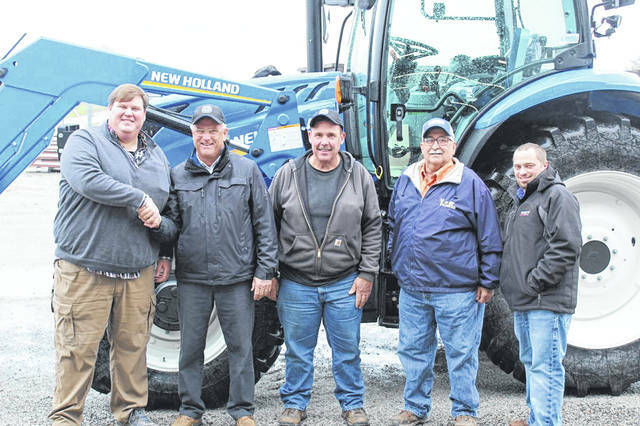 On Nov. 19, Apple Farm Service dropped off a pristine New Holland T6.175 tractor for the Clark County Fairgrounds to use, free of charge, for up to a year! After the Clark County Ag Society has put the required hours on the tractor, it will move on to a well deserving local farmer. Submitted by Apple Farm Service.